I've had this on my list for a while. I needed some funny and/or sweet this week. It's been a long, rough week. This really did put me in a good mood. It was funny and cute. The story follows Noah who has been friend-zoned for 3 years to the girl who he thinks is the girl of his dreams. He gets a chance to go back in the past and re-do everything. Should he? Why not? Does no one ever, ever learn?????? Sighs. Oh well. But yes, Noah will try to fix the past a few times but for some reason, it goes wrong. Did he never watch that Brandon Fraser movie or any sort of time traveling movie or book??? I guess not. It was so funny to see how bad he screws things up. Even in the "perfect" timeline, it goes wrong. Can't say, but that was the saddest one. I actually teared up. Everything seemed SO perfect, but alas, you can't change the past without having to deal with the outcome. I loved Carrie. She was for sure the voice of reason in all the timelines. She was bitchy and hilarious. I would want to be her or have her be my BFF. Noah was okay, but my goodness I wanted to slap some sense to his thick little head!!!!! Just be happy Avery wants you to be his friend. Stop being an idiot. Being in the friend zone is not all bad. Stop being blind!!! Look around you! The true love of your life could be around the next corner. Sighs. There were some plotholes too, but what do you expect with a time-traveling movie?? I really, really liked the ending. It was so good!! It made all the plotholes and annoying moments worth it. Noah really grew up. Thank goodness!! I wanted to like him, but his immature ways killed me. All-in-all, I liked this film. 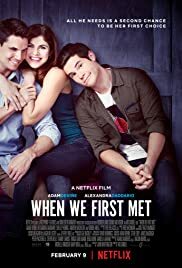 It is not the best movie and there are some issues, but it made me laugh and made me sad. The ending was so good. I'll give this 3 stars. Time travels grrrr... Even Back to the Future had potholes and it was one brilliant series of movies. I ahem, bored to death! Ana, time travel films and books always have huge plotholes.